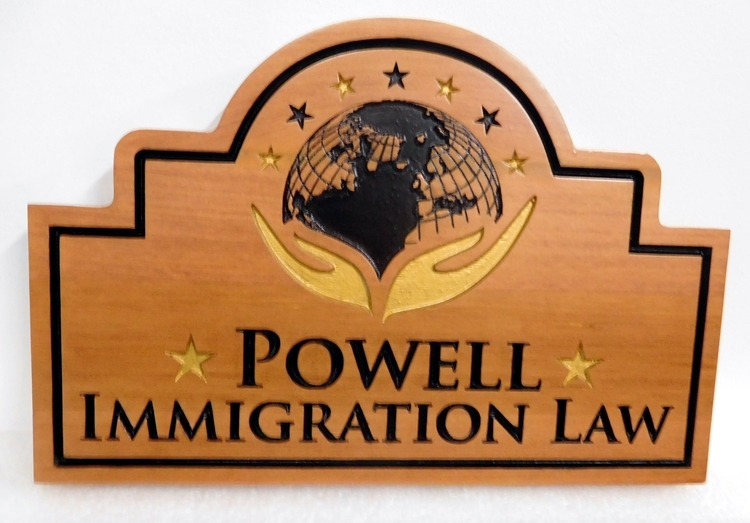 Above is an attractive and attention-getting carved, engraved maple wood plaque for the specialty of immigration law. The plaque features a carved image of the world with hands beneath that care for the world. The plaque is protected by a two appications of highest quality Mathews clearcoat.To see 250 other sandblasted, engraved, carved 2.5-D, or premium carved 3-D High-Density-Urethane (HDU) and wood signs and plaques for attorneys, law offices, prosecutors, judge chambers and courtrooms, please click on Gallery 10 - Attorney , Law Office, and Courthouse Signs and Plaques.